Eugene Andrew "Gene" Cernan (/ˈsər.nən/; March 14, 1934 – January 16, 2017), (CAPT, USN, Ret. ), was an American naval officer and Naval Aviator, electrical engineer, aeronautical engineer, fighter pilot, and NASA astronaut. Cernan was born in Chicago, Illinois. He was raised in Bellwood, Illinois and in Maywood, Illinois. He studied at Purdue University and at the Naval Postgraduate School. He traveled into space three times: as Pilot of Gemini 9A in June 1966, as Lunar Module Pilot of Apollo 10 in May 1969, and as Commander of Apollo 17 in December 1972, the final Apollo lunar landing. On Apollo 17, Cernan became the eleventh person to walk on the Moon and the most recent man to walk on the Moon since he was the last to re-enter the Lunar Module Challenger after the mission's third and final mission. Cernan was also a backup crew member for the Gemini 12, Apollo 7 and Apollo 14 space missions. 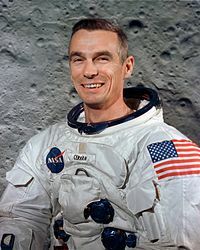 Cernan died on January 16, 2017 at a hospital in Houston, Texas, aged 82. ↑ "Remembering Gene Cernan". NASA. 16 January 2017. Retrieved 16 January 2017. ↑ Graczyk, Michael; Borenstein, Seth. "Gene Cernan, Last Astronaut to Walk on the Moon, Dies at 82". Retrieved 16 January 2017. Wikimedia Commons has media related to Eugene A. Cernan. This page was last changed on 4 October 2018, at 15:29.